"Priscilla" is one of the latest in the Supertunia line of Proven Winners. 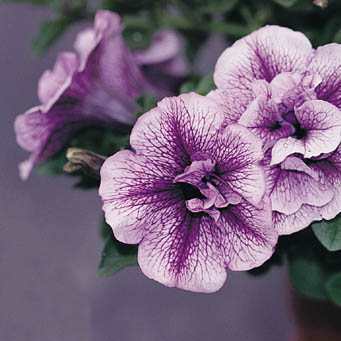 It is a fragrant double petunia that is durable and easy to grow. We grow other Supertunias, such as , and also the equally easy to grow Surfinas. Supertunias are a vigorously trailing new species of an ever-blooming, long-living petunia from Australia. Available in seven different colors, they provide long-term color in full sun areas throughout the season, and can grow nearly an inch a day! Their profuse blossoms and fast growth make them ideal for baskets, beds, balconies and combination plantings. Look for other Supertunias and other great plants at the Provenwinners website.